The process of researching and purchasing a hot tub spa can be overwhelming. There are a lot of products on the market. A consumer has a big task simply in learning to tell the difference between the good companies, the great companies and the companies to avoid. The price of a spa means something, but the value of a spa, the reputation of the company and the trust you have in your salesperson are all far more important factors than the price tag on the spa. The better your relationship with your salesperson, the higher your spa value will be and the more money they will save you by managing the process professionally and ethically for you. Gone are the days of hovering sales guys waiting until a moment of weakness to start a conversation. Spas are a commodity – with thousands of comparable models on the market varying across the board in price and in features. Consumers have the power of the internet to research and compare before stepping foot into a showroom or picking up the phone. Our team will work with you to ask you targeted questions about your needs, the features you are seeking, and the price range you are looking in. We listen to your answers and we make recommendations based on your criteria – saving you time, stress and eliminating uncomfortable conversations in a high pressure environment. 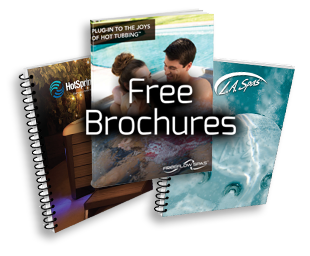 We send you photos, brochures and links to the spas you are interested in so you can learn all about the features. We also invite you to test our hot tubs in person with a test soak. How can I get product pricing? Please call us to discuss the models you are interested in and request product pricing. Your spa search experience will be easier for you if you give me the opportunity to assist you personally by listening to your questions and addressing your concerns in a brief conversation. Let us provide you with valuable checklists to assist you and save you time and money. What is the best way to get the information I need? Call us. We want to help each client find the perfect product to fit their individual fitness goals, lifestyle preferences, space requirements and family entertainment needs. Do you have local technicians to fix problems? Yes, we have certified technicians who will be able to assist you locally with support on any hot tub or swim spa issues. You can call us anytime to connect you to them. How can I see or try a spa? The best way to see or try a spa is to visit our showroom. Why should I buy from Florida Spa & Pool Warehouse? We believe in customer satisfaction and long term client relationships. We will be here to support you when you have questions, need supplies or have concerns. We also promise to meet or beat any price from our competition, so you’re guaranteed the best deal on your purchase.